Well, no one expected this from DC Comics’ revival of its Hanna-Barbera properties. The ‘50s/’60s animation juggernaut churned out beloved property after beloved property, but wasn’t particularly known for the transgressive storytelling on display in DC’s Flintstones comic, for instance, which uses the charming, dinosaur-slave-labor-exploiting prehistoric family as a way to discuss class and workers’ rights, or Wacky Raceland, which transports the goofy drivers of Wacky Races to a post-apocalyptic wasteland. On January 3rd, Flintstones writer Mark Russell returns to the H-B corner of DC with artist Mike Feehan for Exit Stage Left: The Snagglepuss Chronicles, a mini-series that envisions the pink mountain lion best known for exclaiming, “Heavens to Murgatroyd!” as a closeted gay playwright in New York during the “Red Scare” panic over communism. S.P., as he’s known, hobnobs with the real-world intellectual and cultural elite of the era while maintaining his hidden private life at venues like the historic Stonewall Inn gay bar. In advance of the first issue, Paste exchanged emails with Russell and Feehan to discuss the unusual balance of pantless anthropomorphic animals and ‘50s-era transgressive art. Paste: Mark, you’ve tackled near-future satire in Prez and long-ago social commentary in Flintstones—what extra care or preparation goes into working with real-life figures like Lillian Hellman and the Rosenbergs? Is the Algonquin Round Table influential on how you approach humor? Paste: Given Snagglepuss’ quick wit and the renowned intellects of folks like Dorothy Parker, is it at all intimidating writing the dialogue for this book compared to some of your other outings? What helps to get you in the headspace to craft quick, biting retorts and one-liners? Russell: It is intimidating. It’s one thing to write dialogue for cartoon characters, it’s another to put your words in the mouth of Dorothy Parker or Truman Capote. It takes a special form of arrogance to think you can pull that off. Luckily, I have that form of arrogance. I don’t know if it’s deserved, but I think as a writer you should always be biting off more than you can chew, putting yourself in danger. It’s the only thing that keeps you growing. Paste: Although much of the first issue focuses on the “Red Scare” and anti-communist purges in the arts, Snagglepuss’ sexuality and position as an early gay tastemaker are at the heart of the book. What kind of queer media did you consume to form his character and flesh out gay culture in this time period? Paste: Mike, what visual touchstones have helped inspire your take on this underground gay world? Mike Feehan: We only get a quick glimpse of that world in issue one, but Mark has been great with providing me with folders full of reference for locations and people for each issue. I’ve also spent a lot of time collecting my own references and reading about this underground world in NYC and the state in which it existed between WWII and the Stonewall Riots. Places like the Stonewall and the 181 Club, these secret clubs that were owned by the mob so that they could operate under the radar. Although our protagonists are talking animals, I think it’s important for the world that they inhabit to accurately reflect that period. Paste: Given that the topic of Exit Stage Left is so far removed from the original Hanna-Barbera cartoons, have you still found the source material useful in crafting character and story inspiration? Feehan: Surprisingly yes. Every time I read one of Mark’s lines, I hear it in that Snagglepuss voice. That voice and his mannerisms stay in my head whenever I’m drawing his face. S.P. might be in a very different place than you’re used to seeing him, but I think he’s still very much Snagglepuss. Also, whenever another classic Hanna-Barbera character makes an appearance, I’ll go back and watch some videos just to re-familiarize myself with them before I start drawing them. Russell: Yes, in a way. I wrote this series as a sort of origins story, about what Snagglepuss did before his debut as a cartoon character in 1959 and the tragic events that led to his career in television, which he sees as a sort of poor cousin to theater. Theater, even in the cartoons, appears to be his first love. Paste: Mike, how do you approach the anthropomorphic characters of the book? Was it difficult to strike a balance that looked natural with your human figures without making characters like Snagglepuss and Huckleberry look like mascot suits? Feehan: It has been a challenge to find that balance between too realistic and too cartoony, but I’ve actually found it to be my favorite part about working on this book. I knew I wanted these characters to resemble the actual animals as much as possible, but obviously animals don’t emote in the same way that humans do so I’ve had to take some liberties. I’ll pull up a bunch of photos of whatever animal I’m drawing, then I’ll make faces in a mirror I have on my desk and try to translate those facial expressions onto the animals in a way that works. I’m sure I look very silly pretending to be an angry hippo, but it’s fun. Paste: And speaking of—a few familiar HB faces pop up throughout the issue. Should we expect to see more before the miniseries is done? Russell: Yes. There will be more cameos by both Hanna-Barbera and non-Hanna-Barbera characters. Feehan: In the first issue you meet Lila, Huckleberry Hound and Peter Potamus, and you’ll see several more pop up throughout the series. I have to say that I really have a lot of fun drawing Peter Potamus in particular. 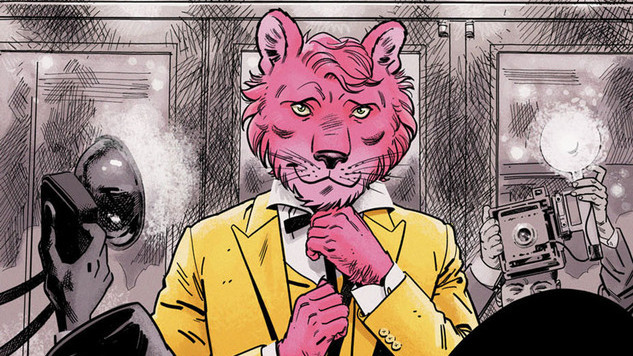 Paste: One of my favorite little touches to the world of Snagglepuss is that S.P. and most of his fellow walking, talking animals don’t wear pants. Was that a conscious decision to reference the cartoon origins? Or just visually more fun to draw? Paste: Given how thin the barrier between politics and entertainment is in 2017, has it been at all illuminating or challenging to look back at this period in history? Are you seeing it through a different lens after the events of the last few years? Feehan: A few years ago I would have looked back at this period as a dark chapter in history that hopefully society had learned from and moved passed. Unfortunately, I’m not so sure about that today. While I don’t think it’s possible for something like the House Un-American Activities Committee to exist today like it did in the ‘50s, what concerns me is that there seems to be a large group of people who wouldn’t mind if it did. There’s a very serious divide going on right now that only seems to be growing and it can be scary to think about where we go from here. Russell: In times of great national peril, it’s common for a society to demand conformity in an attempt to feel safe. To shut down dissidents, to quietly get rid of those who speak out against brutality or injustice or who just make us uncomfortable. It’s the primary reason why the forces of conservatism and nationalism are always trying to convince us we’re in a state of national peril. ISIS is an endangered species of nutball facing imminent extinction in the desert. As a danger to Americans’ lives, they rank somewhere between unicorns and bathtubs, but without propping them up as some sort of existential threat, it’s harder to convince people of the need to turn away Muslim refugees or build a wall on the border. But this impulse toward conformity and acceptance is utterly destructive to a nation’s culture, and in the end, a subversive culture is the only thing that moves people forward. Nobody grows without being challenged.